A blog post published earlier this month is inciting an important debate about the structure of high school days and how classes should be taught. A blog post published earlier this month is inciting an important debate about the structure of a high school day and how classes should be taught. After 17 years of teaching, Alexis Wiggins tried out being a student. In a new position as High School Learning Coach at an American International School, her principal suggested that she shadow a 10th-grade student and a 12th-grade student for a day each. "I could not believe how tired I was after the first day," Wiggins wrote in a blog post about the experience, where she said she also felt bored and patronized. Educators around the world are joining the conversation, remarking on their own experiences, recognizing shortcomings in their teaching methods and suggesting improvements. "We need to be mindful of what our students are going through as they sit in our class. They are talked to all the time, so let’s work to engage them and maybe make our class one of the less-miserable ones they have to sit through. No one in the class is probably as passionate about our subject as we are, and we need to remember that," one commenter wrote on the original post. Each of the takeaways was couched in Wiggins' experience and how it affected the students' ability to learn. By sitting all day -- especially through long block classes -- Wiggins paid less attention and retained less information throughout classes. When she got home at the end of the day, she was too tired to do any work and was in bed by 8:30 p.m.
Wiggins also identified a striking lack of autonomy felt by students. She asked her 10th-grade host "if she felt like she made important contributions to class or if, when she was absent, the class missed out on the benefit of her knowledge or contributions," and the student laughed and said no. For the third takeaway, Wiggins noticed that teachers were likely to unsympathetically criticize students and roll their eyes, especially when asked similar questions multiple times. Wiggins was not accusatory in her write-up. She acknowledged that these are aspects teachers across the board -- herself included -- do not realize from the front of the class. "It was so eye-opening that I wish I could go back to every class of students I ever had right now and change a minimum of ten things," Wiggins wrote. Grant Wiggins, Alexis' father, is the president of an education reform group and runs the blog her post was published on. He wrote in a follow-up post that "by the very nature of the job of teaching, we are prone to be insensitive (literally) to the actual daily experience of our students." He noted that, years ago, he had filmed himself teaching and was horrified by what he saw. While it might be difficult for a person to assess objectively how they work, experiences like this help reveal possible ways to improve. Rather than focus on how horrible the experience was, Alexis Wiggins suggested small changes that could be made in the classroom, like mandating mid-class stretching and setting timers to limit teacher lectures. 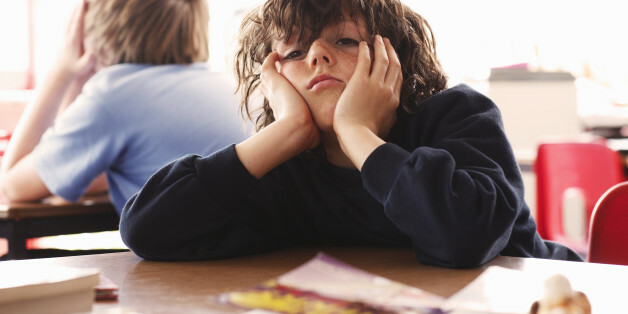 "Is it really a teacher’s job to simultaneously entertain, coddle, educate, humor, activate, discipline, and safeguard 35 students with a smile on his face at all times?" one commenter on The Washington Post wrote. "Yes, that is exactly a GOOD teacher’s job," another commenter responded.